Clean air is vital to the health and well-being of employees. Fresh, oxygenating air is not only better for overall health, but can also have a net positive gain on productivity. According to the 2008 research study, Work Performance, Productivity and Indoor air, investing in good indoor air quality systems will not only considerably improve the employees well-being but have a positive financial return in less than two years. In the last twenty years, there have been several reports highlighting the concerns of the Sick Building Syndrome. Carbon emissions from both the building itself and the building occupants, noise pollution, chemicals from cleaners and paints, and even the fragrances employees wear all increase the indoor pollution levels; cleaning solutions, carbon dioxide, dust and debris also contribute toxins to the air. In fact, buildings contribute to 80% of carbon dioxide emissions. In the manufacturing sector, the air toxicity level is amplified with additional pollutants released into the environment including oil mist and fumes that may contain toxic chemicals such as manganese and lead. When a building is not properly ventilated with outdoor air, it can also result in a build up in human bioeffulents, such as carbon dioxide and viruses, as well as other indoor contaminants. In fact, HVAC systems may play a role in distributing the containments throughout the occupied space. And that’s not all. If not properly maintained, the system itself can be a contaminant, adding to the already existing pollutants in the building. According to a 2014 report by Safe Tech Environment Ltd, today’s HVAC systems are created to provide good air quality and thermal comfort at a reasonable cost. 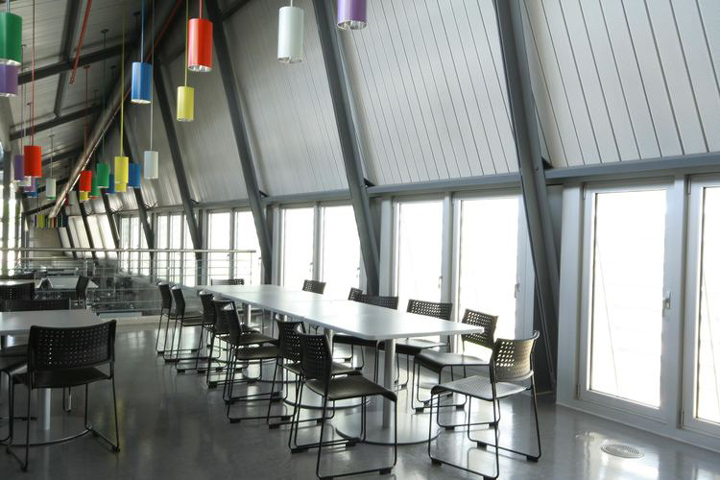 The type and application of these HVAC systems, however, can have a dramatic impact. Ventilation rates below 10 L/s per person result in lower air quality and worsening health problems. Venting outdoor air into the building is one of the best ways to help fight off these syndromes. This form of ventilation helps bring outdoor air inside the building, while at the same time it helps to remove and dilute indoor generated pollutants. The risk of the Sick Building Syndrome is significantly reduced when the ventilation rates increase to about 20 L/s per person, and carbon dioxide concentrations are below 800 ppm. This can be an elusive target since air quality is constantly changing, and pre-heating colder air or pre-cooling warmer air requires an energy consumption increase. In fact, many buildings set their indoor air quality to 1,000 ppm to counter outer air pollution. Many buildings are exploring the capability of storing energy at night for release during the day while benefitting from improved ventilation rates and lower night time pollution. For industrial areas, fumes that are a natural result of the manufacturing process may further compromise outdoor air quality. Engine exhaust, smog or other items may also compromise the fresh air. For these regions, continuous, real time, outdoor airflow during peak production hours may negatively impact the air quality and as a direct result the health of the employees. High quality filtration systems help mitigate the risk when outdoor air quality may be less than desirable. Efficient ventilation is the key to ensure a continuous stream of high quality, clean fresh air. An effective system should provide a consistent stream of ventilated oxygen into the environment while helping to remove carbon dioxide, excess heat, toxins, and odors. The traditional form of building ventilation requires energy from a HVAC system and ventilation fans. This active form of heating and cooling can be cost prohibitive and in effect create additional carbon emissions. As a direct result, buildings have sought ways to reduce energy costs, becoming more air tight, and in turn decreasing the overall airflow. Unfortunately, this cost savings measure may result in a negative impact on the overall indoor air quality. When looking at solutions to achieve better air quality and reduce costs, builders should look at not only the HVAC system, but also the entire foundation that supports the system. Relying on the HVAC system alone for air quality can be costly and impact carbon emissions. 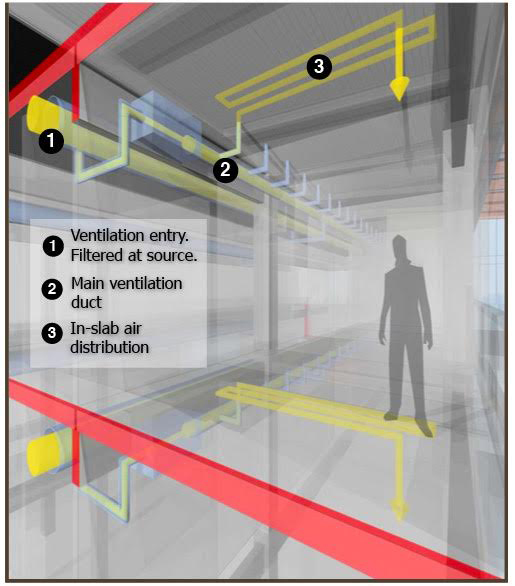 While the ventilation system may be properly designed by engineers to meet the latest ASHRAE requirements, the system needs ongoing maintenance and filter replacement. Failure to do so can result in reduced indoor air quality. Alternatively, factories should look at the building envelope, including areas of leakage to ensure that the indoor air quality is maintained at a consistently healthy level. Incorporating energy efficient techniques, like energy storage, into the foundation is a cost-effective way to both heat and cool a building. Hollow core slabs, which can be placed in both a ceiling and floor of a building, are a perfect example of this. 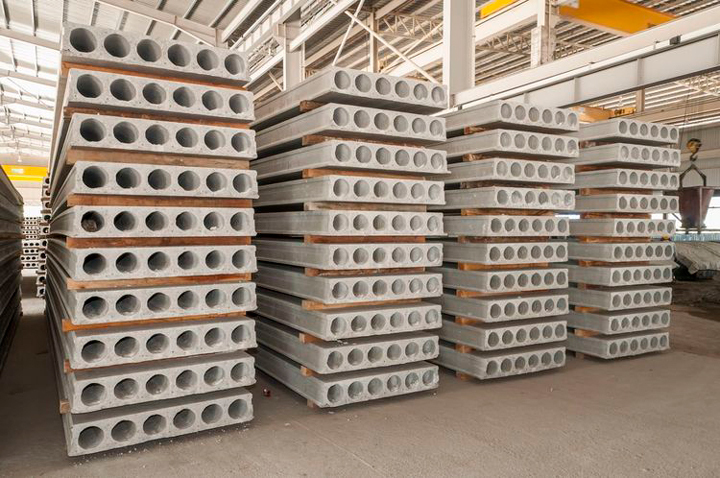 When properly combined with a ventilation air system, the thermal mass of concrete hollow core slabs can significantly reduce or even eliminate the need for bulky heating and cooling machinery, resulting in decreased energy consumption. In the summer months, the system can be used to force air ventilation to draw in the cool nighttime air, cooling the slabs and reducing the overall indoor day temperature without using the carbon emitting HVAC system. The integration of concrete hollow core slabs into a building decreases the overall impact on the HVAC system. The all-encompassing positive result is that engineers can use a smaller HVAC system decreasing the upfront carbon emissions and reducing costs altogether. Through integration of mechanical systems with the existing structure, a building can go from idle to intelligent structures capable of storing energy at night for release during the day while benefitting from consistent ventilation. As an additional benefit, this system harnesses and stores the healthier, outside nighttime air into the slabs, which are then released during the day to heat or cool the building. 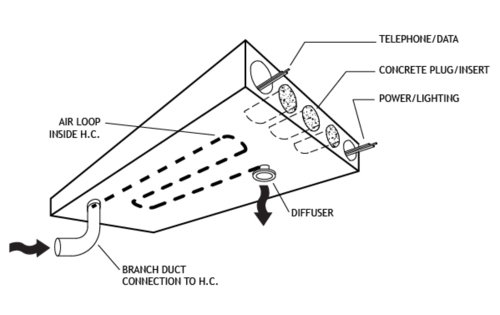 The fan-assisted ventilation in these systems is used to push the outdoor air through a series of main ducts, which are fed into smaller branch ducts and placed throughout the hollow core slab structure. When the air passes through the system it works to either warm or cool the building, while also providing a consistent flow of fresh air into every corner of the building. There is no question that increased outdoor air ventilation can have a positive impact on the indoor air quality. When companies are looking at sustainable solutions, they should consider ways to introduce clean air into a building while also looking at methods to minimize the pollutants created by the systems themselves. New plants and commercial buildings can take advantage of similar emerging “Smart City” initiatives to better manage their energy infrastructure; such as hollow core slabs that use thermal mass and storage to provide consistent air flow, and efficient heating and cooling.